With a home made curry paste and a base of Sweet potato, mushroom, potato and cauliflower you know it will taste awesome! 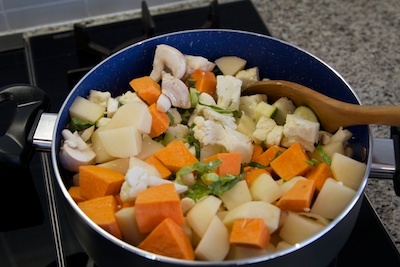 Add the chopped mushrooms, cauliflower, potato, sweet potato and zucchini to a large pot. Set aside - do not put on stove yet. Next, prepare your curry sauce base: Add tomatoes, pepper, curry powder, cashews, sugar, desiccated coconut and sea salt to a blender. Blend for 1 to 2 minutes until nice and creamy. Set aside. Get your pot and put it on medium-high heat. 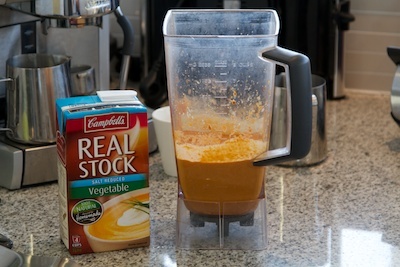 Add 2 tbs of vegetable stock and stir for about 5 minutes to get the vegetables heated through and starting to steam in their own juices a little. 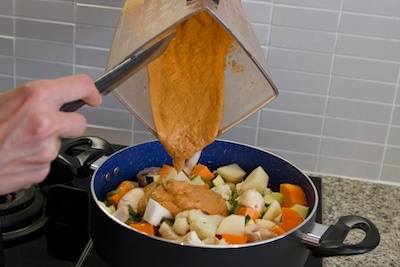 Add the creamy curry sauce and stir through for about 3 minutes to evenly coat the vegetables. 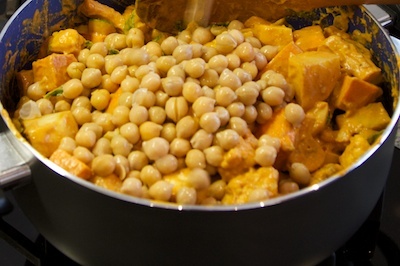 Add the chickpeas and mix through. 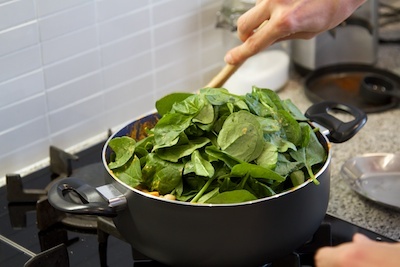 Add spinach leaves to the pot. 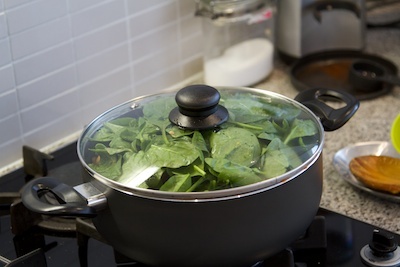 Put lid on pot and let the spinach steam for about 3 to 5 minutes until wilted. 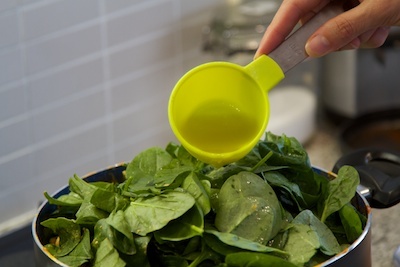 Remove lid and stir wilted spinach through curry. Put lid back on, lower heat and let simmer to 45 minutes (or until vegetables are soft). 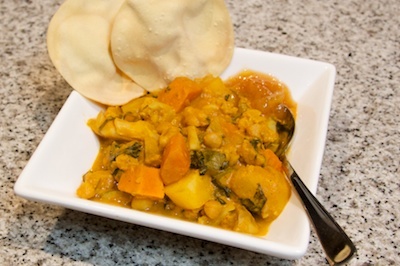 Serve this delicious creamy vegetable curry with your favorite chutney, poppadoms and rice! YUM! 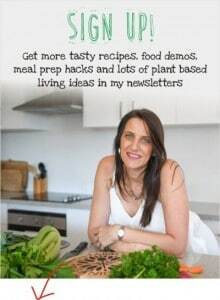 I love your YouTube channel and the ease of your plant-based recipes. 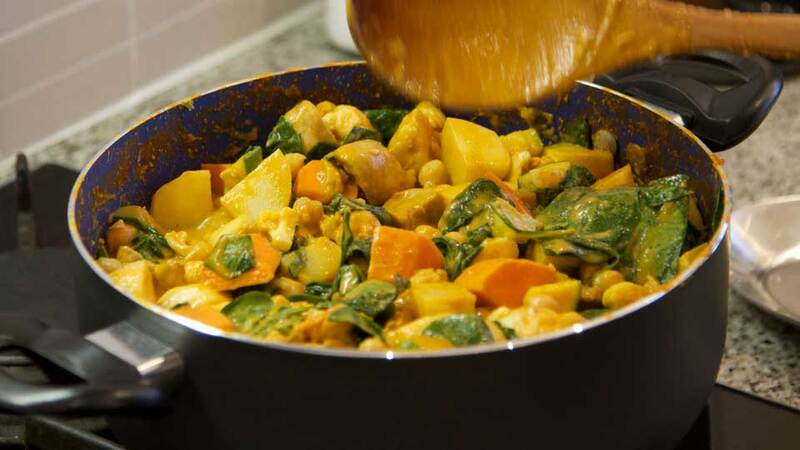 Are you planning on making a video for this vegetable curry recipe? It looks delicious! Keep up the great work! 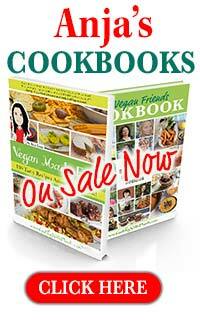 I’m not really one for vegan food (still eat meat, sorry ) but you have some mighty tasty looking recipes on your site. I will be trying out your smoked paprika cheese and banana bread recipes tonight as they look super healthy. I’m intrigued by your potato crusted quiche also. Thanks heaps for the recipes. Happy that you are eating MORE vegan options 🙂 It’s really a tasty world of food once you discover all of the fantastic ingredients and recipes. Greetings from Sri Lanka. I came across your YouTube videos and website by accident. I am a vegan and I am constantly searching for recipes to try out. Your recipes look delicious. 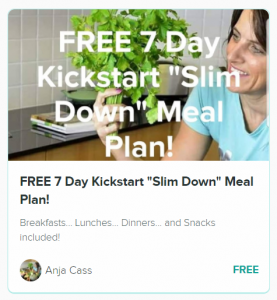 Our main meal is lunch so I will use the dinner recipes for lunch. Dear Anja, I am writing to you from Romania 🙂 I look at your recipes almost every day. They are fantastic and a source of inspiration for a family of four. We have been vegans for the last 7-8 years. I like your recipes because they are easy to make and they don’t require unusual ingredients. I made this curry and it was delicious. I could recommend it to anybody! 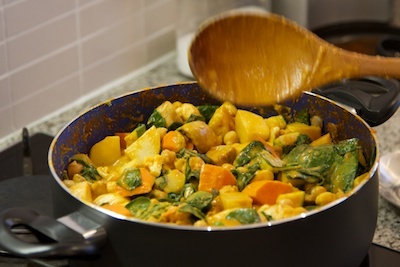 I am holding cooking classes and I would like to ask for your permission to present this curry recipe some time in the near future. Many thanks for your time and willingness to share. God bless you! I made this last night…….IT WAS AMAZING!!!! I added more curry. mm mm good!!!! I made this today. I didn’t have cauliflower, but I had a cut up butternut squash. So I subbed the squash for the cauliflower and potatoes. The sauce was so good, I left out the sugar and used 3 tablespoons low fat coconut flakes. I also cannot cook without adding onions and garlic, so I sautéed an onion and a clove of garlic in the pan with the curry powder and an additional tsp of turmeric for the health benefit. Cooking the spices like this developers the flavor better. Instead of spinach I put in a bunch of cut up kale, since it needed to be used up. I needed more than 2 tbsp of veggie stock to keep the food from sticking. It came out great! I love recipes like this that are forgiving so you can use ingredients you have on hand and still get a great result, thanks so much! OMG. 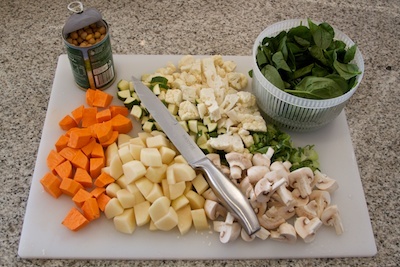 This is an amazing recipe, we ate it for dinner tonight and I have left overs for lunch (so looking forward to that). It’s a keeper. Thoroughly recommended. Thank you Anya. Love your work. Anja, I made this a little differently as I could not find sweet potato here in Spain right now so I used pumpkin which disintegrated and made it very creamy. I also added a lot more spinach as we just love wilted spinach.